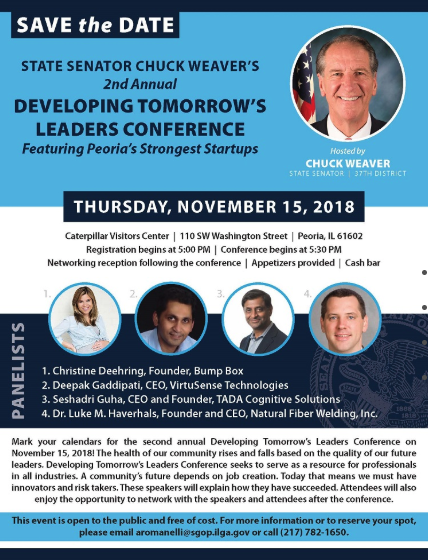 PEORIA, IL (11/1/18) — Seshadri Guha, CEO and Founder of TADA Cognitive Solutions is honored to be featured as a panelist at State Senator Chuck Weaver’s 2nd Annual Developing Tomorrow’s Leaders Conference. Dr. Luke M. Haverhals, Founder and CEO, Natural Fiber Welding, Inc.
From the start, TADA has had a vision to create an enhanced startup ecosystem for the greater Peoria area. “We appreciate Senator Weaver’s actions in recognizing not only TADA’s contribution, but for continuing to champion the importance of startup activity in our region” says Seshadri Guha, CEO and Founder of TADA. This event will take place on Thursday, November 15, 2018 at the Caterpillar Visitors Center - 110 SW Washington Street, Peoria, IL 61602. Registration begins at 4:30 PM and the conference will begin at 5:00 PM. There will be a networking reception following the conference with appetizers provided. This event is open to the public and free of cost. For more information or to reserve your spot, please email aromanelli@sgop.ilga.gov or call (217) 782-1650. Chuck Weaver is a Republican member of the Illinois Senate for the 37th senate district, appointed in October 2015. The district he represents includes all or parts of Mercer, Lee, Bureau, Henry, Knox, Stark, Peoria, Woodford and Marshall counties in Central Illinois. TADA is a proprietary cloud-based platform that helps reshape the way businesses make strategic and operational decisions by leveraging the power of digital duplicate technology. The TADA solution is live and grows/changes with your business. We are much more than static dashboards, and provide infinite navigation, reporting, analytics, and collaboration capabilities out of the box. We create substantial value for our clients by providing digital business solutions that create ten times the value in one tenth the expense of competitive offerings. For more information on how TADA turns complexity into competitive advantage, please visit: https://tada.today/.